Queen Victoria has just finalized her schedule for next summer, and she’s staying in Europe. Most of her itineraries are perfect for North Americans looking for a luxury experience in Europe because of the way they are arranged. Azamara has put their 3DI virtual reality views of the ships and shore excursions into an Apple app, in addition to on the dedicated website. A shore excursion used to mean an island or city sightseeing tour or a trip to the beach. Not necessarily anymore, especially on Royal Caribbean. That’s because the line has been collecting or creating more and more memorable or unique activities ashore. Today’s shore excursions on RCI can make the shoreside portion of your cruise into just what you want it to be. It could make a lifetime memory for you or your family at a port of call. The complete story appeared in the August 13 edition of Cruise News Daily. The northern Chinese port of Tianjin is a home port for Royal Caribbean’s Mariner of the Seas. Fortunately it was at sea during the huge explosion that rocked the port yesterday. Mariner is scheduled to turn around there on Saturday, and Royal Caribbean says they are monitoring the situation at the port. Details appeared in the August 13 edition of Cruise News Daily. 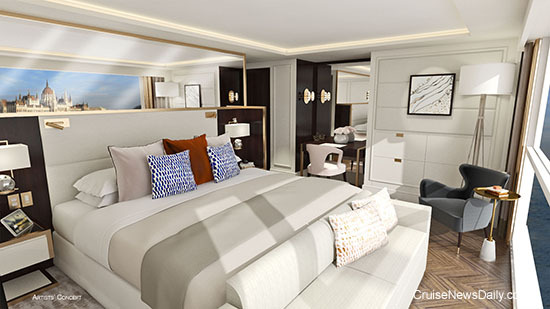 Seabourn’s latest, Seabourn Encore, is still a bit more than a year away (entering service in late 2016), but Seabourn is ready to unveil the suites. Why do cruise lines always show suites when most people travel in standard accommodations? In the case of Seabourn Encore, suites are all they have. There are five types of suites on the ship. The ones that intrigue us the most are the Veranda Suites. These are the “standard cabin” on this ship, but make no mistake - they are more than a “cabin.” The Veranda Suites are what the vast majority of passengers aboard Seabourn Encore will have booked. The complete story appeared in the August 12 edition of Cruise News Daily. WASHINGTON, Aug. 12, 2015 -- Cruise Lines International Association (CLIA) today announced that Thomas P. Ostebo who recently joined CLIA as President and CEO has stepped down from the position immediately, due to personal reasons. In the interim, Cindy D'Aoust, Executive Vice President of Membership and Operations, will assume the role of acting CEO and oversee the management of global operations and the CLIA leadership teams until CLIA appoints a permanent CEO. "CLIA's current leadership team is doing an outstanding job supporting our membership and driving the vision of the organization globally, even during this time of transition," said Global CLIA Chairman Adam M. Goldstein, President and COO of Royal Caribbean Cruises Ltd. "While it is unfortunate that Tom is departing CLIA, his desire to put his family first is a testament to his character, and we wish him the best in all his future endeavors." Celebrating its 40th Anniversary in 2015, Cruise Lines International Association (CLIA) is the unified voice and leading authority of the global cruise community. As the largest cruise industry trade association with 15 offices globally, CLIA has representation in North and South America, Europe, Asia and Australasia. CLIA's mission is to support policies and practices that foster a safe, secure and healthy cruise ship environment for the more than 23 million passengers who cruise annually, as well as to promote the value, desirability and affordability of the cruise vacation experience. Members are comprised of the world's most prestigious ocean, river and specialty cruise lines; a highly trained and certified travel agent community; and cruise line suppliers and partners, including ports & destinations, ship development, suppliers and business services, committed to the sustained success of the cruise industry. For more information on CLIA, the cruise industry, and CLIA-member cruise lines and travel agencies, visit www.cruising.org or www.cruiseforward.org or follow Cruise Lines International Association's on the CLIA Facebook and Twitter fan pages. SEATTLE, Aug. 12, 2015 -- Fathom™, the pioneer in social impact travel, has named Jason Maltais as the company's East Coast senior sales lead. In this role, Maltais will be responsible for marketing and business development supporting sales of Carnival Corporation's (NYSE/LSE: CCL; NYSE: CUK) Fathom brand that is pioneering the new category of social impact travel. Maltais joined the company in July reporting to David Drier, vice president, sales for Fathom. "Jason's experience in leading large scale initiatives, driving innovation and ability to take a strategic vision and executing on that vision will play a pivotal role in strengthening Fathom's position as an industry leader," said Tara Russell, president of Fathom and global impact lead for Carnival Corporation. "He is committed to fulfilling Fathom's sales goals through collaborating with travel professional partners by successfully marketing and selling unique products and services. He has a proven track record of generating sales through social media and executing a wide array of digital media strategies – this expertise is invaluable when reaching out to millennials, one of Fathom's core target audiences." Maltais joins the Fathom team from Norwegian Cruise Line, where he was program manager responsible for building programs that maximized revenue from online travel agencies and provided strategic and tactical direction aligned with corporate and departmental goals. Additionally, Maltais served as account executive for Royal Caribbean Cruises, where he was responsible for creating and executing marketing initiatives and projects while managing the marketing and incentive budgets. Prior to that, he served as the BDS for Royal Caribbean International where he partnered with assigned BDM's and travel partners to create and exceed sales goals. "I am delighted to help lead Fathom's unique focus of creating a lasting social impact while building long-term relationships with local communities and impact partners," said Maltais. "It's a privilege to work with a company founded on the sincere belief that the person-to-person connection is among the strongest catalysts for transformation. I am eager to serve travel professionals as they welcome their clients to embark on a transformative journey." A resident of Miami, Florida, Maltais earned an Associate of Arts in Business Administration and Management from Santa Fe College. Royal Caribbean International introduced their Royal Suite Class today for passengers traveling in suites on their larger, newer ships, effective next May. Norwegian Cruise Line Holdings signing a 15-year agreement to remain at the Port of Seattle. Following the commercial restructure at Carnival UK, Paul Ludlow has been appointed senior vice-president, sales & marketing for P&O Cruises. Ludlow, 36, who joins from Princess Cruises where he was managing director UK & Europe, will have full responsibility for the sales, sales support, marketing, guest insight and digital teams across the brand. The restructure will also include a similar SVP sales & marketing role for Cunard. Recruitment for this position is currently underway. Princess Cruises will be recruiting for Paul Ludlow’s replacement. During his tenure at Princess Ludlow established separate commercial operations for Princess in the UK, including dedicated teams responsible for revenue management, sales, marketing, reservations, customer relations and PR. He led the team which launched Royal Princess in Southampton, by HRH The Duchess of Cambridge. He also oversaw the growth of Princess guests from the UK, including the successful introduction of Asia as a key destination for the UK market and launched new travel agent tools, such as Flight Select and OneSource cruises, part of the line’s programme to support and reward its travel agent partners. Carnival UK CEO David Noyes has today, August 11, 2015, announced a commercial restructure for P&O Cruises and Cunard Line. As part of the restructure sales & distribution director, Chris Truscott will be leaving the business. Paul Ludlow has been appointed senior vice-president, sales & marketing for P&O Cruises. Ludlow, 36, who joins from Princess Cruises where he was managing director UK & Europe, will have full responsibility for the sales and marketing for P&O Cruises as well as sales support, guest insight and digital teams for both brands. The restructure will also include a similar SVP sales & marketing role for Cunard, working alongside Rick Meadows, president for Cunard in North America. Recruitment for this position is currently underway. Jeremy McKenna, head of partner sales will lead the agency sales team, currently for both brands, reporting directly to Ludlow in the interim period until the SVP Cunard sales and marketing role is appointed. A number of river cruise operations in Europe have described themselves with the term “luxury,” but with the first details of Crystal’s take on river cruising, it seems that there’s always room for more luxe. The line appears to have a number of features that are going to wow the luxury set and take Crystal’s luxury experience inland. The complete story appeared in the August 10 edition of Cruise News Daily. 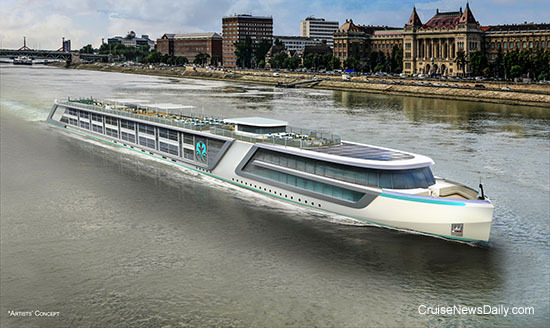 Renderings courtesy of Crystal Cruises. All rights reserved. May not be copied or used without permission. Some people select their cruise by ship, while itinerary influences the choice for others. If you are heavily into social media, you should be selecting your cruise based on whether or not the ship has Carnival’s new social media internet package. More than half the Carnival fleet now offers unlimited internet access to social media sites for just $5 a day (or less), and the rest of the fleet will be online with the budget-friendly service by the first quarter of next year. MIAMI, Aug. 10, 2015 -- Carnival Corporation & plc (NYSE/LSE: CCL; NYSE: CUK), the world's largest travel and leisure company, today announced that Michael Ungerer, currently president of Germany-based AIDA Cruises, has been appointed Chief Operations Officer-Shared Services for Carnival Asia, effective September 1, 2015. Ungerer will relocate to Shanghai, China, and directly support each of the Carnival Corporation brands operating in the region to leverage the company's industry-leading presence and scale in the region. Added Thamm: "We also look forward to adding Felix to our senior leadership team and having him continue the great momentum that AIDA Cruiseshas established as one of the top cruise lines in the world." Ungerer, 49, joined AIDA Cruises in 1997 and has been President of AIDA Cruises since July 2012. From July 2004 to June 2012, he served as AIDA Cruises'Senior Vice President-Operations, responsible for marine operations, new ship builds, guest services, shoreside operations, entertainment and purchasing. He played an important role in the company's product development, as well as further developing AIDA Cruises' high standards of quality for providing a world-class guest experience. Eichhorn, 35, started his career at AIDA Cruises while studying business administration. In the following years, he worked in a variety of increasingly responsible positions ashore and onboard before taking on the role of senior vice president of sales, yield management and flight operations. He assumed responsibility for the sales and revenue management of AIDA Cruises and Costa Germany in 2013.